Unintentional Hilarity: Gray Skies Are(n't) Gonna Clear Up; Put On A Happy Face : Blog Of The Nation Unintentional Hilarity finds hilarity where you least expect it... the global recession! 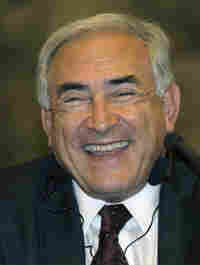 This, friends, is a gentleman named Dominique Strauss-Kahn. He is a French economist, and the managing director of the International Monetary Fund. Why is he smiling, you might ask? I HAVE NO $%^*! @#$ IDEA. At the press conference where this photo was taken, he had just said, "The global outlook will continue to deteriorate. The possibility of global recession is really in front of us." But man, what a great smile. This is less Unintentional Hilarity then, um, just plain irony, I s'pose.